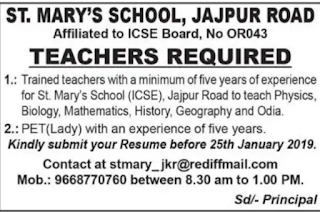 St.Mary's School,Jaipur Road,Odisha,has advertised for the recruitment of Teaching Faculty- Teachers.Interested and eligible job aspirants are requested to submit resume before 25th January 2019.Check out further more details below. 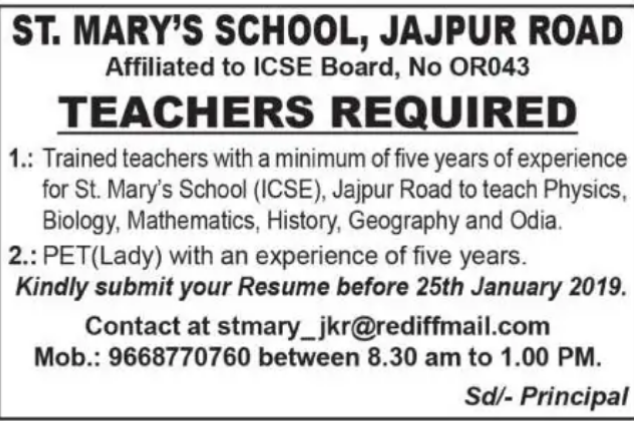 Name of the School: St.Mary's Schools, Jaipur Road,Odisha. Trained teachers with minimum 5 years of experience. Salary Package: Based on experience and Qualifications. How to Apply: Kindly submit resume before 25th January 2019.